Color: Color is very important for tone, energy and readability. I’m going to focus on the latter here. One of the most common mistakes I see in email is choosing colors that “vibrate” or “negate”. For many, bright red symbolizes a call to attention, a great deal, a stellar lead price… and studies show that it works. However, red is a color that can “vibrate” heavily against blue. This image may look fine to you, or it may begin to “vibrate” intensely the longer you look at it. The other issue is color negation. 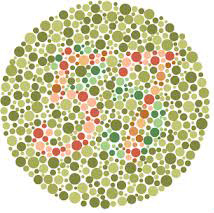 Ever take one of those color-blindness tests? Can you see the number? 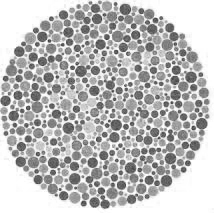 If you are color-blind, you may not. This is because the color values here are very similar, and have the same level of contrast… to illustrate just how similar, I can eliminate the color altogether. Choose colors that have differing contrast, not just color, to ensure readability and legibility. Be sure to subscribe to our blog email list to be notified about our next blog post on email design: Above the Fold. 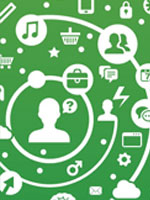 And, if you missed our last Email Design Principles blog, you can access it here.